While the breakup of a marriage is always a sad occasion, divorce no longer has the stigma it once did. While the overall number of people getting a divorce has remained steady in recent years, there is one particular age group in which the rate continues to climb. This is among older adults, over the age of 50. Some of these couples are in second or third marriages, while others have been together for a matter of decades. The following highlights some of the special issues involved in each of these types of cases. 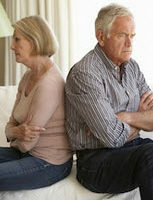 Children of prior marriages: Older couples may have adult children from previous relationships. Unfortunately, funds you have worked to obtain and leave for your heirs through your estate planning documents could end up going to your spouse. Marital property division: When older couples enter second or third marriages, they may already own a home, furnishings, and other types of property. While the Florida Statutes concerning property division only apply to that property earned, acquired, or otherwise accumulated during the marriage, contributions either party made in maintaining or paying off the property could be an issue. Retirement benefits: Pension benefits and funds in 401k are also subject to the laws of equitable distribution. This means that benefits you have worked for years to accumulate for your retirement could be up for grabs. One of the easiest ways to address these issues is to do so prior to getting married. A prenuptial agreement can help to protect you, your spouse, and other family members. While some older adults who get divorced have been in prior marriages, others are ending a relationship after decades of being together. According to Market Watch, a more accepting social attitude towards divorce has resulted in couples feeling more entitled to end a long term relationship which no longer works in their older years. In these types of divorce cases, spousal support is often an issue. If one of the partners makes less than the other or had previously given up a career or their educational pursuits for the sake of the marriage, they can be at a distinct disadvantage in having to re-enter the workforce. In these cases, spousal support may be ordered as a way to ensure they continue to enjoy the lifestyle maintained during the marriage. If you are facing either of the above situations, it is important to have a trusted and experienced Fort Lauderdale divorce attorney on your side. To request a confidential consultation regarding how we can assist you, reach out and contact the law firm of attorney Vanessa L. Prieto today.